When I was younger I used to knock myself out throwing Dinner Parties. I would pore over cookbooks and foodie magazines, spending hours putting menus together, striving to get the balance right. I felt pressured to choose the perfect wines, the best music, the most suitable table decorations. But that was only the beginning. Then came the preparation, which was usually a culinary marathon. And of course there was the question of what to wear. The house needed to be cleaned and beautified. It was always a full scale production. These days I’m much more relaxed. Sure, I still knock up the infrequent ‘special occasion’ dinner, but what has become most important to me is the opportunity to share my table with friends over a simple home-cooked meal. If I want fancy food I can go to a restaurant! One of the most enjoyable aspects of living in the country is that sharing meals is a very common way of getting together. It might be a cup of tea on the veranda, a barbeque down by the river, or a simple lunch or dinner. Nothing fancy. In fact, most often it’s about stretching what we (or our hosts) would have eaten anyway just that little bit further. Why did I ever worry so much about getting a dinner ‘right’? We ran into (well, not literally) neighbours out walking their dogs on the winding country road that leads to our farm late on Wednesday as we were coming home from our trip to the Outback. Pop over for dinner on Friday, I suggested. I’ve missed our friends and I wanted to catch up properly. Thursday I napped. And did a mountain of washing. I began catching up on the hundreds of emails and messages that have piled up in my absence. I forgot all about my invitation. Yesterday I cruised the Farmers Markets, and then came home and remembered we had the neighbours coming for dinner. I had a poke through the garden, the pantry, the fridge. I’m tired from all these drugs I’m on, so it needed to be a throw-together meal. Dinner: Lamb Roast and homemade gravy and real mint sauce, roasted pumpkin and sweet potato, and crunchy fresh coleslaw. 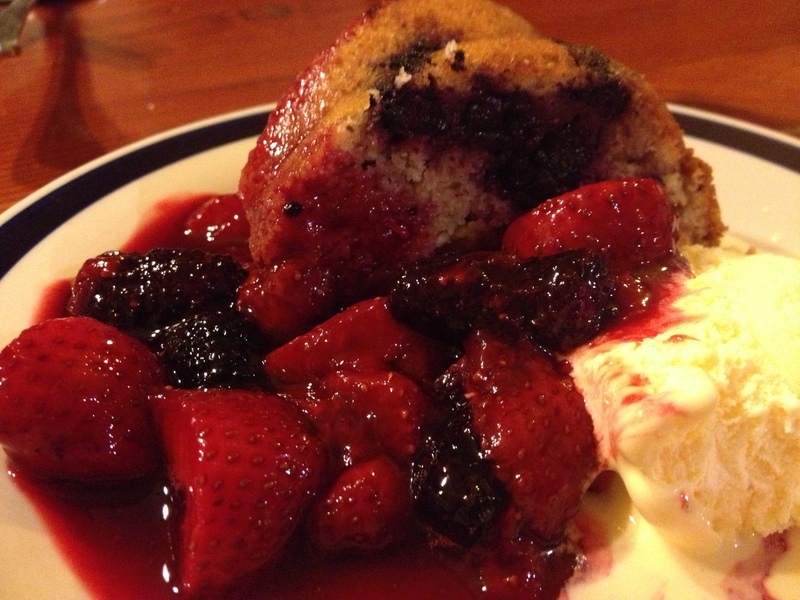 Dessert: Fresh Strawberry and Mulberry Cake (dead easy!) with an impromptu berry compote (fancy word for saucy berries) and ice-cream. Good old fashioned chuck-it-in-the-oven-and-it-cooks-itself roast and to be just a little bit special a simple dessert, because who doesn’t love cake??? 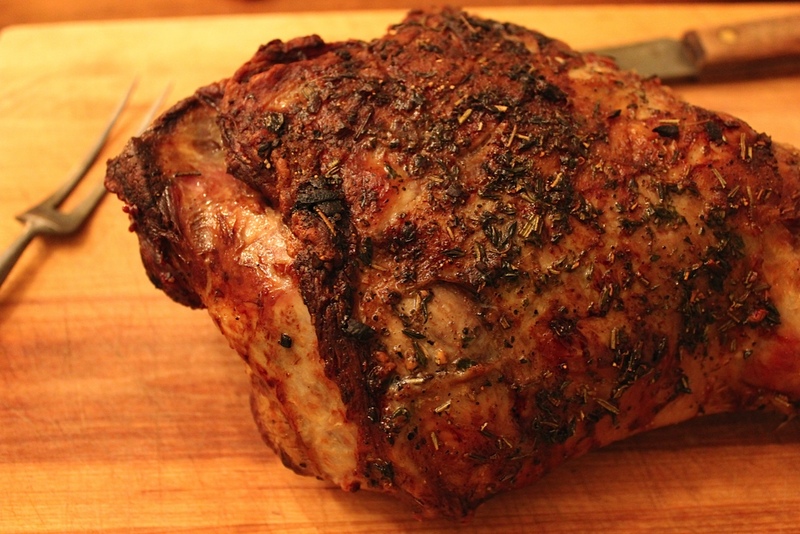 Food doesn’t need to be spectacular. It just needs to be honest and fresh. And the very best things about dinner last night? 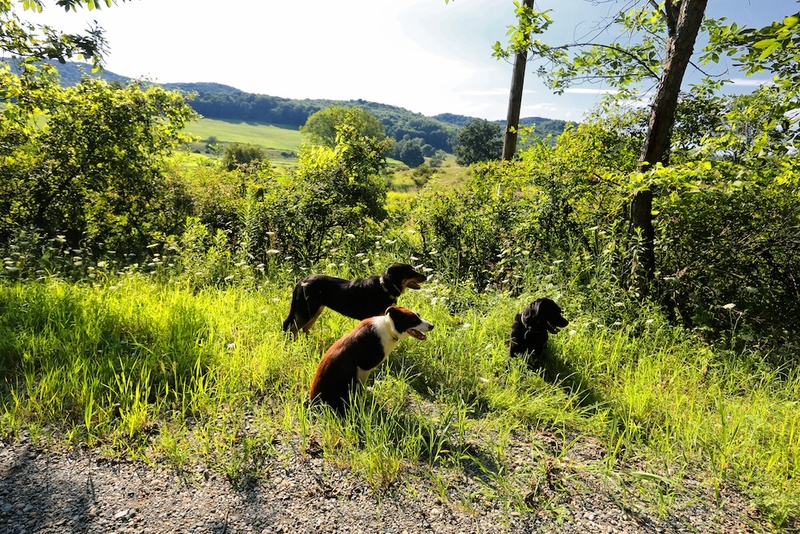 The company was relaxed and terrific – and they brought their dogs (as well as a bag full of fresh mulberries)! No dressing up for me – I wore my pirate pyjamas and a favourite apron. A neighbour set the table, and another helped me serve. We chatted endlessly about farms, drought, the environment, the elections and all the local gossip. We all washed up together, and I was in bed by nine! Today we have friends from the city dropping in. And now I have all these lovely left-overs. I’ll give them cold roast lamb and chutney sandwiches and a slice of the leftover Strawberry and Mulberry cake for lunch. Lashings of French Earl Grey Tea and a wander around the garden to stretch our legs afterwards. Recently we stayed with friends at their Outback Station, between Longreach and Barcaldine. 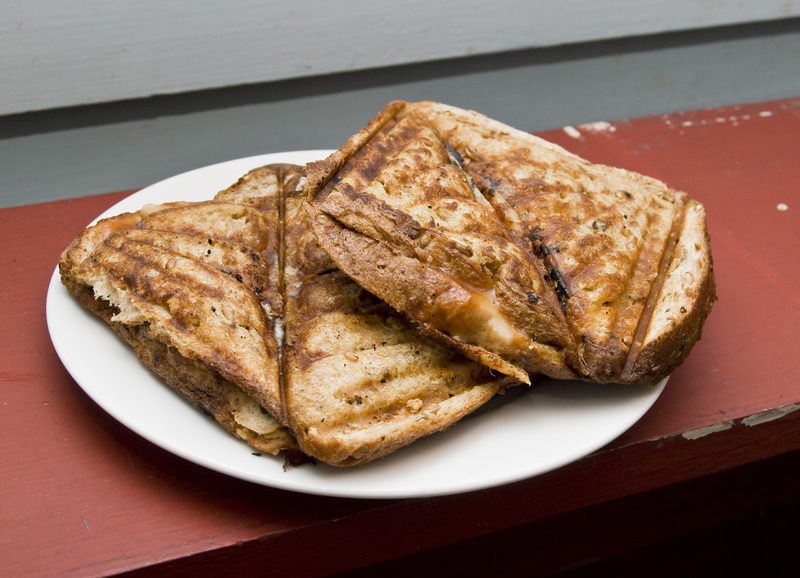 On one memorable night, I had a cheese toastie and a cup of tea for dinner as we girls sat around the kitchen table chatting while the boys were off watching the footie on TV. Another fabulous breakfast was simply bacon and eggs, with tinned spaghetti on toast. I was as happy as a pig in mud. A meal at home with friends is really about friendship. The food is just a bonus. If you’re ever over my way for a cuppa and a chat, don’t expect me to drag out the best china and slave over a hot stove for days, modelling artful and pretentious food. Do expect a full stomach of whatever’s going, and to be asked to help in the kitchen or with the washing up. After all, isn’t that what friendship is all about? This entry was posted in Farm life, Food, Uncategorized and tagged dinner parties, dinner table, friendship, home cooked meals, living in the country, real food, sharing by Cauldrons and Cupcakes. Bookmark the permalink. Great post about the delights of simple living and sharing moments with friends and neighbours. We rarely have company so when we do I stress over it. I wish I could be more relaxed like you. 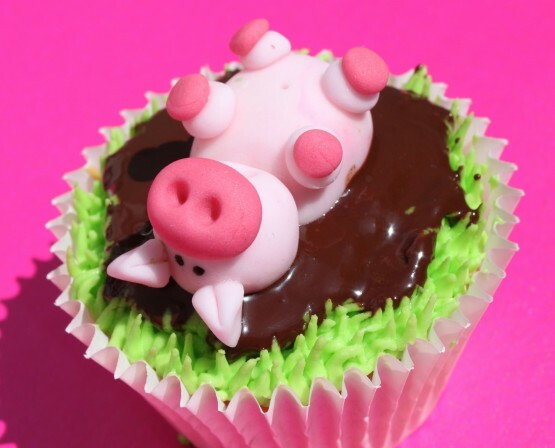 That pig cupcake is beyond cute. Wow! I jump up and down clapping in celebration of this post. Let’s hear it for getting older, calmer, and more centered as we focus on what’s really important: the company! I too used to really knock myself out doing big shin-digs but now I also focus on easy down-home tasty meals as I remain calm, cool and collected. I want to visit with the dear ones that have come over. Thanks for another delightfully inspiring post Nicole!